Few things can raise the spirits as quickly as a stroll through Olympia’s bustling downtown. Local shops, flavorful restaurants and bright art gives us a boost even on the dullest grey day. 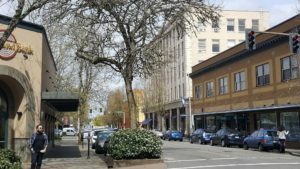 Property owners and business owners who have chosen to make the center of Olympia their home have invested a lot, both in money and in effort, to breathe new life into the area, making it an even better place to go with family and friends. Creating an even better downtown doesn’t just give us a nice place to shop (though that is a definite perk! ), it boosts tourism, adds jobs as businesses grow and increases overall quality of life in the community. To work toward their objectives, the Alliance has several committees made up of a cross-section of downtown property owners and businesses, from restaurants to retailers. These committees are rolling out exciting new programs to make the heart of the city a better place to live, work, eat, play, and shop. One such committee, the Downtown Vibrancy committee provides insight and oversight of the Alliance’s efforts to create a vibrant urban setting. They are doing this with a multifaceted new approach to make downtown clean and safe. One of these new efforts is an Emergency Alert Platform between local businesses. This service is complementary to Downtown Alliance members and will let people be in instant communication in an emergency event. The platform is in a testing phase but will be launching soon. Since thriving businesses are a large part of a successful downtown, this committee is helping to provide grants to the businesses in the area to boost safety. The Alliance, in partnership with the City of Olympia, is working on a Crime Prevention Through Environmental Design (CPTED) program. 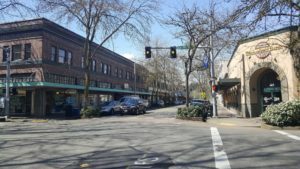 The program provides $70,000 in Community Development Block Grant dollars, directed through the City of Olympia, to assist stakeholders with new lighting, security cameras and alcove gates. Feeling safe is vital to patrons in the area and the Alliance is committed to doing its part to increase that feeling amongst residents, visitors, and businesses. For businesses, there is a training element offered at the Alliance “Elevate Olympia” conference June 11 and 12. During the clean and safe educational track speakers will discuss the downtown walking patrol deployment; resources such as the Downtown Ambassadors and Clean Team, and the Community Care Center; a mental health and addiction primer and techniques in de-escalation. The Alliance is also focused on helping keep the heart of the city clean. Recent efforts include working with a vendor to offer comprehensive pressure washing services on downtown sidewalks. The Alliance also manages the Volunteers in Paint program. This group will add a fresh coat of paint to buildings that need it in the urban core. Adding to the visual appeal of the downtown area will make it more attractive to those driving through that are thinking about stopping for a bite or a quick shopping spree. A key piece of this effort to encourage a vibrant urban center is the new Downtown Safety Team. Keeping evening hours, Safety Team services will include a visible presence on the street, reporting of suspicious activity, providing social service information, and trespass engagement. More importantly, they will provide visitor assistance for tourists and others who may be looking for that perfect craft brew or a mouth-watering meal! The 2-person team will be on foot and is scheduled to work 4-hours per day, 7-days a week, year-round (except for major holidays). This service will commence May 2nd. The Safety Team is intended to complement the good work of the Olympia Police Department and the City-operated Ambassador Program. Programs such as downtown ambassadors, guides, or safety teams have supported downtown revitalization efforts nationwide. In a large majority of these instances private property owners have financed these efforts.. Relevant examples on the west coast include Seattle, Tacoma, Portland, Vancouver B.C., Los Angeles and Long Beach. Stakeholders in the city center have voluntarily invested in this program, with over 70 percent of properties represented. The large majority of these are property owners. As the Safety Team program rolls out, the Alliance will play a coordination role between stakeholders and the entity contracted to provide Safety Team services, Pacific Coast Security (PCS). PCS currently plays a similar role in downtown Tacoma. In fact, they have decades of experience in Olympia and beyond. Locally, they provide service at Olympia City Hall, LOTT Wastewater Treatment, Timberland Library, Intercity Transit’s Downtown Transit Center, and the Community Care Center. The Olympia Downtown Alliance continues to work in coordination with stakeholders, the City of Olympia, Olympia Police Department, and the Ambassadors and Clean team to ensure a vibrant and thriving downtown that is welcoming for everyone. 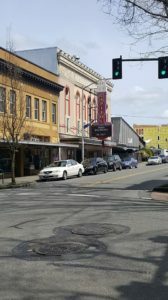 For more information, visit the Olympia Downtown Alliance website.